The first week of school can be incredibly crazy and overwhelming so trust me when I tell you that your child’s teacher will appreciate this thoughtful Teacher Survival Kit for Back to School. I will never forget at the end of my daughter’s first week of Kindergarten her teacher said to me, “I am so exhausted”. And she looked it too. It was then that I realized just how hard it must be to be a teacher. Having some busy children myself I know what it’s like to try and wrangle them throughout the day. But to have a classroom full of eager and excited children, especially during those first few days and weeks of school….it must be very tiring. Now I imagine that throughout the course of a day teachers just might need a little pick me up. That’s where this Teacher Survival Kit will come in handy. All it really is a tin full of chocolate but I guarantee it will be just what your child’s teacher will need. I decided that I wanted to doctor it up just a bit so I made a cute “#1 Teacher” label to replace the chalkboard label/sticker that came with the tin and of course added the “Teacher Survival Kit” tag as a finishing touch. 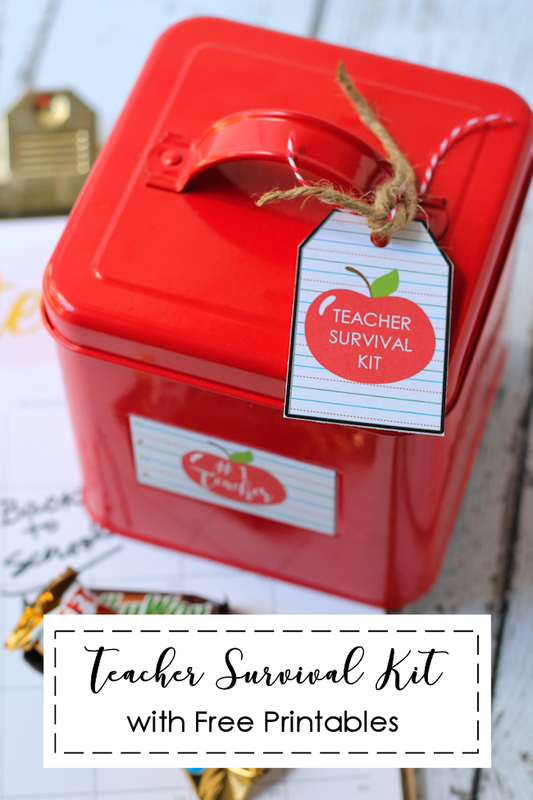 You can print the “Teacher Survival Kit” tags and “#1 Teacher” labels onto white card stock and cut out. Remove the chalkboard sticker from tin and replace it with the #1 Teacher label using double-sided adhesive. Punch a hole in the Teacher Survival Kit tag and attach with string. It’s as simple as that. For more Back to School Teacher Gift Ideas, check this out! This is so thoughtful!! Great idea to show appreciation to the teachers. These are so cute! I totally haven’t thought about teacher gifts for back to school since it’s the first year for both of my kids, but I totally want to put something like this together for them!